DPCSHP Notification is out. DPCSHP is recruiting for 146 Warders Govt Job Posts. You can check DPCSHP - Directorate of Prisons and Correctional Services Himachal Pradesh last date, download DPCSHP notification, visit DPCSHP official website and check other DPCSHP Vacancy details.Complete Vacancy and recruitment Details about 146 Warders Govt Job vacancies in DPCSHP are provided below by JobSarkari.Com only for you. Last Date for Apply Online 20/01/2019. Mode of Payment Application Fee Can be Submitted through Online Gateway or Offline Challen Mode. Total No. of Vacancy 132. Total No. of Vacancy 14. Candidate Must Have Passed 12th Class. General (UR) Mini 18 And Max 23 Years. SC (UR) Mini 18 And Max 25 Years. OBC (UR) Mini 18 And Max 25 Years. OBC (Home Guards) Mini 20 And Max 28 Years. ST (UR) Mini 18 And Max 25 Years. ST (Home Guards) Mini 20 And Max 28 Years. General (Wards of Freedom Fighter) Mini 18 And Max 23 Years. GEN/OBC (Antodaya/IRPD) Mini 18 And Max 23 Years. SC (Antodaya/IRPD) Mini 18 And Max 25 Years. GEN/OBC (Home Guards) Mini 20 And Max 28 Years. SC/ST (Home Guards) Mini 20 And Max 28 Years. OBC (Home Guards) 5.6 31"X32"
ST (Home Guards) 5.4 29"X30"
General (Wards of Freedom Fighter) 5.6 31"X32"
1.Candidate Can Apply though Online Mode. 2.Click on the Application Form Given in Important Link Section. 6.Online Application Can be Submitted on or Before 20th January 2018. Q. What is the Last Date For DPCSHP Warders Govt Job Vacancy ? A. 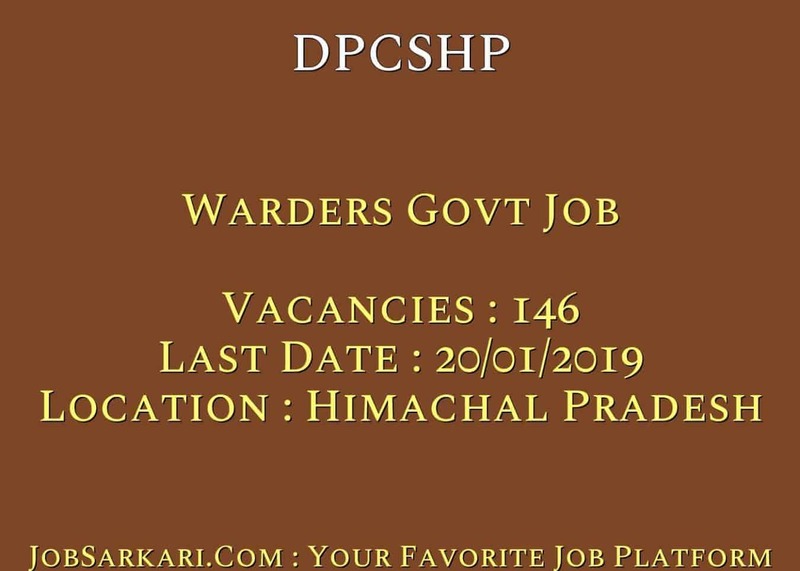 Last Date for DPCSHP Warders Govt Job Posts is 20/01/2019. Q. What is the Form Type of DPCSHP Warders Govt Job Recruitment ? A. The Form Type for DPCSHP Warders Govt Job Posts is Online. Q. 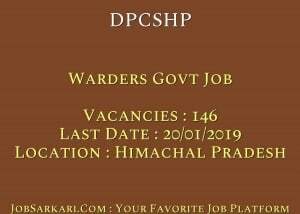 How many vacancies are available in Directorate of Prisons and Correctional Services Himachal Pradesh Warders Govt Job Posts ? A. There are about 0 Vacancies in Directorate of Prisons and Correctional Services Himachal Pradesh Warders Govt Job Posts. Q. What is the Full Form of DPCSHP ? A. Full Form of DPCSHP is Directorate of Prisons and Correctional Services Himachal Pradesh .